I have a new piece in a show: The Cranes of Bellevue. It's a diptych with total dimensions of 40" high x 33" wide inspired by the multitude of tower cranes throughout Bellevue. This piece shows a tiny fraction of the cranes. 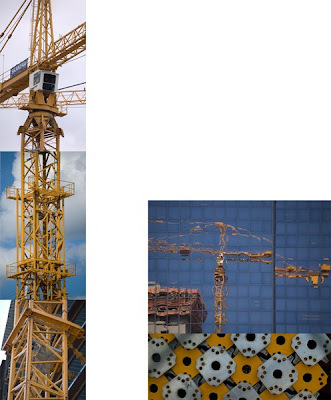 The title is intended to be a play on the many, many images of cranes we have all seen. We see flocks of Japanese cranes and multitudes of Origami cranes (a friend of mine had 1,000 gold ones at her wedding), so here is a collection of tower cranes to go with them. The show is the annual member show of the Eastside Association of Fine Arts. The show is up from now through June 26th at Trilogy at Redmond Ridge. The show is at their Cascade Club (click for a map) and is open 10-5. There are plenty of nice pieces. As always happens when a piece of mine is in a show, it's the only piece like it. I dropped the piece off on Friday and the opening was today. When I got there, I was disappointed to see that my piece had been hung wrong. I had left instructions attached to the back of one of the pieces, but they hadn't been followed. Instead, the two pieces had been positioned about 1" away from each other and the "open sky" in the upper right had been filled in by someone else's artwork. Not only did it ruin my piece, but it did the other piece a disservice as well to have it hemmed in by my piece on two sides. Luckily, I was able to find another (better) spot for the other piece and adjusted mine so it looked right. When I do these pieces, one of the things I'm trying to accomplish is that it gives you three different senses -- from thirty feet, from five feet, and from up close. Fortunately, my piece is positioned in a spot where you can see it from thirty or forty feet away and I'm happy to say it works quite nicely. The piece is brand new, so it had not previously been on a wall (the closest was leaned against my fireplace). I learned two things. First, I originally thought that the pieces should be farther apart (9" instead of 6"), but they felt too disconnected, so I moved them closer. Second, it needs to be high on the wall or the crane side doesn't feel enough like it's towering over you. I did move it higher, but not as much as I would have liked to. I hope the show goes well for you Roy!